Simple one-button switch to shift between transmitter(TX) and receiver(RX) mode.Important Notice:Power on and pairing mode is one long press (don't let it go) about 7-8 seconds. It powers on within 3-4 seconds and into reconnect back mode,then goes into pairing mode after another 3-4 seconds (blue light will Flash quickly). TX Mode:Plug In To Your Non-Bluetooth Device And Pair Up Your Bluetooth Speaker Or Headset. RX Mode: Plug Into Your Non-Bluetooth Speaker And Pair Up Your Bluetooth Phone Or MP3 Player. Built in battery for portable use, or connect to a USB power source for always-on application. 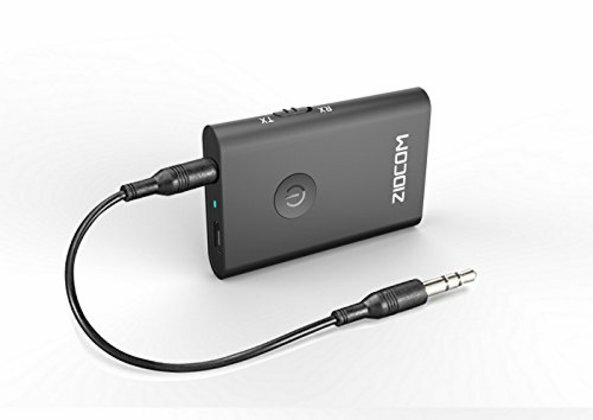 Ideal For Any Powered Speakers Or Devices Using Standard 3.5mm Jack Or AD2P Bluetooth.